Sunday morning after a weekend away for Thanksgiving, I was looking forward to going to the first Advent service at our church, which I knew would be decked out with twinkle lights, tall trees, and a manger waiting for its Baby. We’d arrived home late the night before, and the new day brought with it the aftereffects of travel. The baby was hungry all morning. Daddy chose cute outfits for the kids, but they were too small. Mommy stood in front of the closet thinking that everything in it would be too tight over her still-postpartum belly. And to seal the deal, the toddler pooped in his pants, diaperless. We ‘exchanged words’ all the way to church, pulling into the parking lot in the nick of time (I was to read the lesson during the service). Church itself was fine, but afterwards the baby was hungry again and the toddler had a full-on meltdown in the coat room and mommy & daddy needed a good cuppa joe. Every year, I want to take December off from life outside of our home. I don’t want to work or even write. I just want to bake, watch movies, snuggle in front of the tree, listen to old music, read books, cook amazing meals, spend time with family and friends, and bake some more. Christmastime is only here for such a short while, and I love it so hard, and I just want to spend all of my time in magical Christmas land where everyone else there loves snow and Elf and cookies and sledding and matching jammies, and they all behave beautifully and laugh together and get along, and the snowflakes land in our eyelashes and everything is dreamy AND NOT REAL. Tempting as it is to take the month off of life, Christmas happens right along with everything else in our lives – messy and beautiful and real. Christmas comes with the school lunch packing, with the diaper wiping, with the laundry doing. Christmas comes with the broken hearts, the broken families, the broken cookies. Christmas comes with the demands of work, the exhaustion of extracurricular activities, and the expectations of everyday. Christmas came to a young woman, her fiancee, and a barn full of animals. Christmas came to a dirty feeding trough, common grubby shepherds, and an innkeeper who said yes. Christmas came to a straw-covered floor, the dark of a mid-winter night, the middle of a messy census. Christmas finds us in our real – in the midst of a zany Sunday morning, scrubbing the kitchen floor, wishing for children, missing those who are away – and offers us peace in the middle of it all. Our lives don’t need to stop to embrace it; that peace, and Jesus Himself, wait patiently for us to grab it and breathe of it deeply. God wants to be all mixed up into our everyday. He designed the birth of His son to reflect this, and He delivers Christmas straight into our messes every year. Some moments are calmer than others, but if we look hard enough, we can find moments of Christmas everywhere. It’s just the second day of Advent, of December – how is Christmas finding you in your real so far? 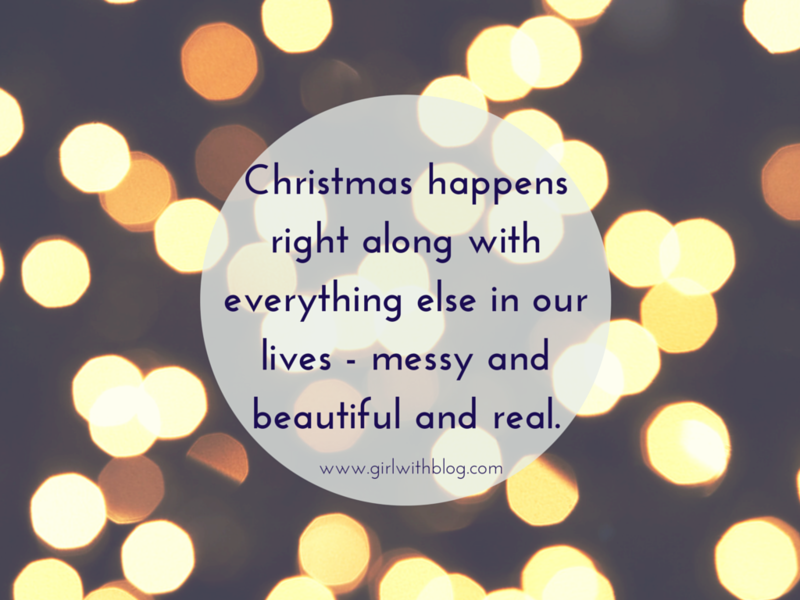 God does come into the messiness. I needed this reminder too my friend! I really enjoyed this post!